***GIANT DISCLAIMER*** There's little way to know which abilities from the Legion datamining are being scrapped, which are just carbon copies of the ability from WoD, but will be changed, or which are specifically intended for Legion and are in their close-to-final state. With that said, the following may be completely wrong, and should be taken as the speculation that it is. 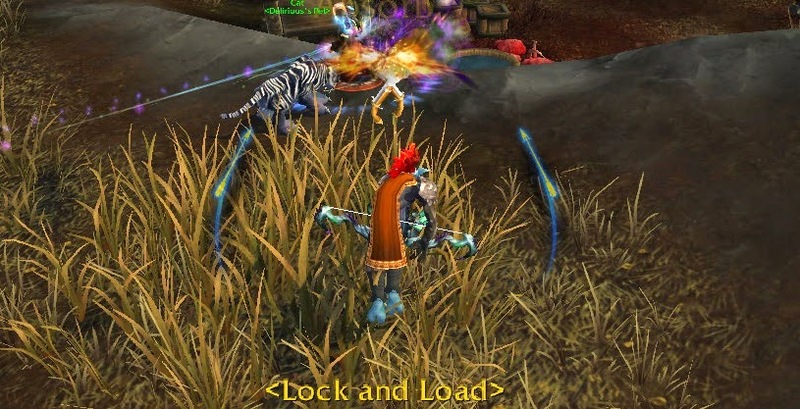 With the Legion Class Preview blog that blizzard published right after blizzcon, we were told Dire Beast would be the only "active" focus regen for BM hunters, with that, the duration was lowered to 8 seconds, and the CD lowered to 10 seconds (compared to a 15 second duration with a 30 second CD currently in the live version of the game). In addition, the focus return from each attack the Dire Beast does was doubled, from 2 focus per hit to 4 focus per hit. Dire Beasts' melee hits roughly once every 2 seconds, modified by haste. 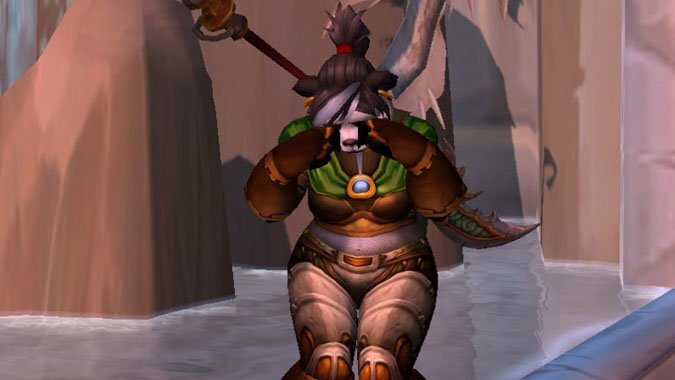 In MoP, a function was added in an attempt to get rid of "Haste Plateaus", which gives abilities like Dire Beast a chance for an additional hit, based on your haste. It's safe to assume we'll continue to see that function in Legion. (This is actually one of those times when it then becomes much easier to then predict the value of something like Dire Beast using a spreadsheet and expected values, instead of trying to simulate the value, in which case you have to add in an psuedo-random number generator, and things get fairly messy). So to calculate Focus regen from Dire Beast, we'll use a base of 4 hits (1 ever 2 seconds for 8 seconds) yielding 4 focus each, on a 10 second CD. That gives us 1.6 focus/second (((8/2)*4)/10=1.6). To add in haste, we'll change the 2 (from 2 seconds) to "2/(1+h)" where h is our percent haste. For example, with 10% haste, we'd just use "8/(2/(1+0.1))*4)/10=1.76". And hey, check this out, you know what's really cool (if you happen to be a giant nerd and find basic algebra exciting)? We can simplify all of that to find the same results just using the base regen of 1.6, and multiplying it by 1+h. That is, "1.6*(1+.1) = 1.76", which we can use with whichever haste point we're at. This is going to get much more complicated momentarily, but for now, we'll move on. Chimaera Shot -- A two-headed shot that hits your primary target and another nearby target, dealing 660% Nature or Frost damage to each target. Generates 10 Focus for every target hit. It is a good thing there's nothing else worth using in the tier with Chimaera Shot, because as Focus-starved as BM is looking, having an ability this powerful that doesn't cost any focus, but instead gives you focus, is just going to be amazing. For the sake of the little thought experiment I'm doing right now, I'm going to proceed as if we're on a single target fight, where we can only get 10 focus total, though when we get around to looking at real raid encounters, it will most definitely be worth looking at how we use Chim Shot to maximize targets. That said, given that this talent will likely be at the very top of our priority list (with the possible exception of when we're above 95 focus and Kill Command is off CD). So we'll be using it exactly every 9 seconds, giving us an average of 1.111 focus/second returned. As they currently exist in the very preliminary Legion data, hunters have a base focus regen of 10 focus/second. With haste, we again simply multiply our base regen by 1+h, that is, with 10% haste: "10*(1+.1)". And now you'll see why I was glad to be able to simply the Dire Beast haste formula to 1.6*(1+h). as A*x+B*x = (A+B)*x, we can now just use 11.6 as our base focus regen, and modify it by haste as per usual and then simply add the focus regen from Chim Shot (which doesn't change with haste). For example, if we have 15% haste, we should have 14.45 focus/second. Wild Call -- Your Critical Strikes have a 30% chance to reset the CD of Dire Beast. This then becomes a fairly bizarre thing to try to calculate, as we need to know our APM (actions per minute) in order to determine our focus regen, but we have to know our focus regen in order to determine our APM. So just to get a feel for the rotation, I'm going to start off with a few assumptions. The first is that "Your Critical Strikes" means specifically the hunter, not our pet's crits. The second is that we'll be able to cast something every second. That may not be true, but it's all we've got to go one so far, so I'll hope it is true. The third assumption, is that Dire Beast does more damage (either through the DB hits, or through the buffs we get for having more pets out) than Cobra Shot (if this isn't the case, it will have some bizarre ramification for our rotation, as DB doesn't actually produce much focus), and it is fairly high on our APL (priority list), meaning if its CD is reset, we'll use it pretty much immediately. Without taking into account the tier 90 talents (aMoC, Barrage and Volley), I'd expect to see .93 hunter hits per second. That is: with 15% haste, we'll auto-shot once every 2.61 seconds (.38 per second); we have one Chim Shot every 9 seconds, or .11 per second; and then for Cobra Shots, assuming we're taking the Dire Stable talent (doubling the focus return of Dire Beast), we should have enough focus to cast 1 cobra shot every 2.315 seconds (on average), and still have enough to cast KC on cooldown. Add that all up to get .93 hits per second. Our next task is to look at the likelihood of getting a crit on one of those hits. Since I arbitrarily choose 15% haste, let's also arbitrarily say we have 15% crit from gear, giving us 25% total chance to critically strike. Those critical strikes then have a 30% chance to reset the CD of DB. That gives us an expected value of .06975 Dire Beast resets per second, or on DB reset every 14.334 seconds. It's worth noting here that that doesn't mean we get all of our regular Dire Beasts, plus an addition Dire Beast every 14.334 seconds. Because it's resetting the CD, it's also pushing back the CD of your next Dire Beast (so if this happens just a second before the end of your DB comes of CD, then you've gained almost nothing, but if it happens a second after you've cast DB, you basically get a double Dire Beast for that duration). If you average that out, you'll end up with roughly 40% more Dire Beasts from Wild Call, or about 8.37 Dire Beasts per minute, instead of the 6 you would get without any CD resets. To modify our original formula for Dire Beast Focus Regen, "(8/(2/(1+h))*4))/10", to account for averaging casting Dire Beast once every 7.167 seconds instead of once every 10 seconds, we just need to change that final "/10" to "/7.167". With our 15% haste and 25% crit, that means we're looking at 2.567 focus/second from Dire Beast, or 5.135, if we're taking the Dire Stable talent. So for BM hunters, with 15% haste and 25% crit (which seem like fairly reasonable first tier stats) and the Dire Stables talent, we can expect to see 16.75 focus regenerated per second, on average. While it may seem 2.56732 focus regenerated per second (without Dire Stables) doesn't seem like very much. After all, Wild Call has a very, very small chance to reset DB, (even at 100% crit, you still only have a 30% chance of it happening). 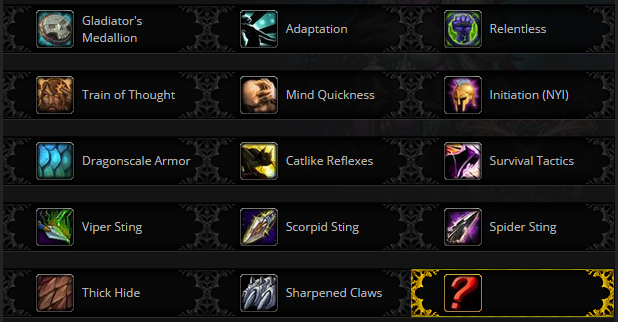 However, I suspect the reason they had to make it so rare to reset, is our Artifact Weapon Talent Tree will be providing some crazy buffs to Dire Beast, as well as to our Focus in general. Call of the Wild -- When Wild Call resets the Cooldown of your Dire Beast, the duration of all active Dire Beasts is increased by 8 seconds. Unleash the Hounds -- Dire Beast has a chance to summon an additional beast. Focus of the Titans -- Maximum Focus is increased by 40. 3 levels. We don't yet know what the chance of some of these things happening will be, but that should help to get rid of a lot of the down time in the rotation, as we level up the Artifact Weapon. Narrow Escape -- Disengage also activates a web trap which immobilizes all targets within 8 yards for 8 seconds. Binding Shot -- Fires a magical projectile, tethering the enemy and any other enemies within 5 yards for 10 seconds, stunning them for 5 seconds if they move more than 5 yards from the arrow. Wyvern Sting -- A stinging shot that puts the target to sleep, incapacitating them for 30 seconds. Any damage will cancel the effect. Intimidation -- Command your pet to intimidate the target, stunning it for 3 seconds. Stomp! -- When your Dire Beasts charge in, they will stomp the ground, causing 400% physical damage to all nearby enemies. Exotic Munitions -- Allows you to modify your ranged weapon to use exotic munitions: Incendiary, Poisoned and Frozen. Delirium's Note, there's no way this tier could possibly go live as is, with one talent so vastly superior to the others. But that said, a chim shot that is not only free, but generates focus? yes please. Big Game Hunter -- Increases the critical strike cahnce of your auto-attacks and cobra shots by 50% on targets who are above 80% health. Bestial Fury -- Increase the damage bonus of Bestial Wrath by 20%. Blink Strikes -- Your pet's Basic Attacks deal 50% increased damage, can now be used from 30 yards away, and will instantly teleport them behind their target. A Murder of Crows -- Summons a flock of crows to attack your target over the next 15 seconds. If the target dies while under attack, A Murder of Crows' cooldown is reset. Barrage -- Rapidly fires a spray of shots for 3 seconds. Volley -- Continuously fire a volley of ammo at the target area, causing Arcane damage to enemy targets within 8 yards every second for 6 seconds. Stampede -- Summon forth a herd of stampeding animals from the wilds around you that deal damage to your enemies. 3 min CD! 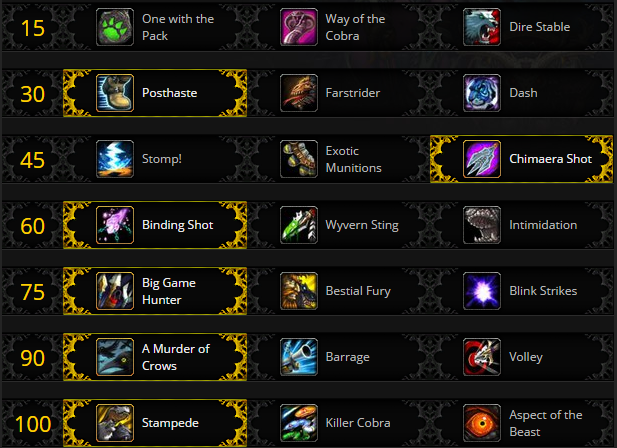 Killer Cobra -- While Bestial Wrath is active, Cobra Shot has a 25% chance to reset the CD of Kill Command. 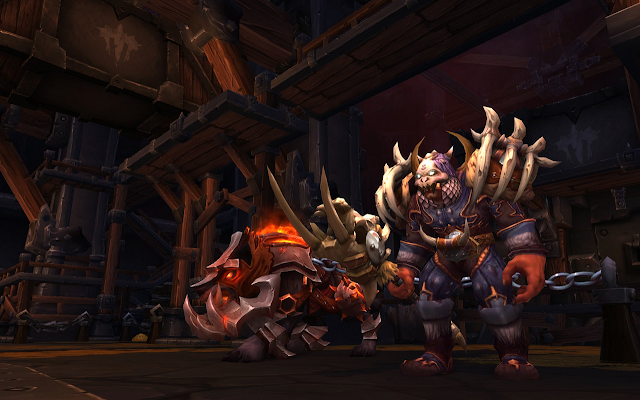 Aspect of the Beast -- Kill Command is improved based on the talent choice of your pet. Cobra Shot -- A quick shot that causes 125% physical damage. Dire Beast -- Summons a powerful wild beast to attack your target for 8 seconds. Each time the beast deals damage, you will gain 4 focus. Summoning a beast reduces the remaining cooldown of Bestial Wrath by 15 seconds. Aspect of the Wild -- Increases the critical strike chance of all skills for you and your pet by 10%, and gain 10 Focus per second for 10 seconds. Go for the Throat -- Your Auto-shot Critical Strikes cause your pet to generate 15 Focus. 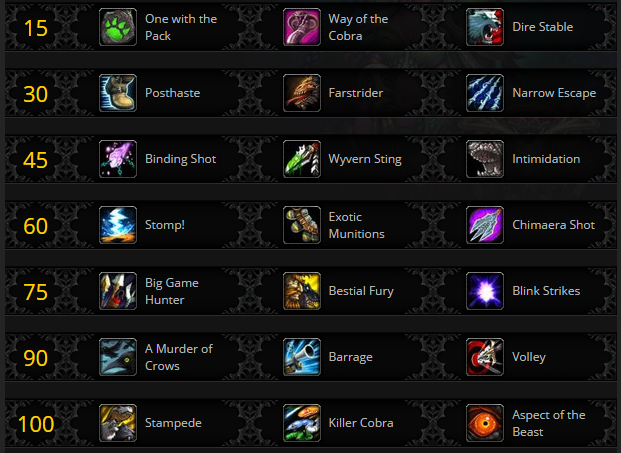 The BM PvP Talent Tree is by far the least complete, with only two of the 6 spec specific talents available. Thick Hide - Honor Level 8 - Unknown. Sharpened Claws - Honor Level 25 - Each attack from your Dire Beasts deeply claw at the target, causing the target to bleed for 4 seconds. This effect can stack up to 3 times. Survival Tactics - Honor Level 37 - Feign Death removes all harmful magical effects, and reduces damage taken by 100% for 1.5 seconds.